Karina's Kreations: Just add color Specilaty DSP! Just add color Specilaty DSP! Look at this fun card! This was one of the make and takes at the creative day getaway. 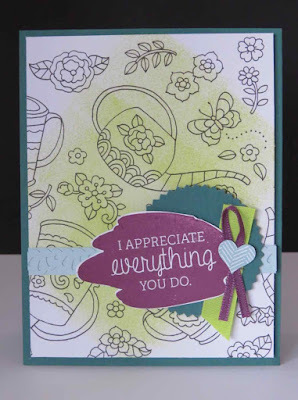 I love this card because it uses the new Just Add Color Specialty Designer Series Paper. # 144180. A splash of Lemon Lime Twist color was added to the paper using a Sponge Brayer #141714. The greeting is from the Just Add Text stamp set #143934 which was the set given out to all attendees. This cute card also uses the new Starburst punch #143717, Decorative Ribbon Border Punch #143721, Lemon Lime Twist ribbon #144135 and Fresh Fig 1/8" Sheer Ribbon #144174. It's a super cute card designed by my friend Brenda!